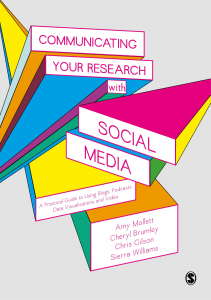 This dynamic, engaging guide from SAGE empowers you to go beyond bar charts and jargon-filled journal articles to bring your research online and present it in a way that highlights and maximises its relevance through social media. A review of the book can also be read here. If you’d like to purchase a copy of the book, SAGE offer a 20% discount to readers. Just enter the code is UKRM20 once you’re at the SAGE checkout stage.